We serve a delicious bakery made soup every day, $3.95 for a cup with a large slice of any of our daily breads on the bread board or $3.25 with a half a sandwich. Check the second page of the newsletter for a complete listing of our soups for the month. We have also recently introduced three new salads, a Cobb Salad, a Greek Salad and our Yardbird. All three and all of their dressings and croutons are made from scratch here at the bakery. Details at the bottom of this page. Try one in the store or take one to go. Your tastebuds will thank you! Taste the difference Great Harvest bread makes. 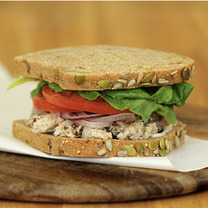 Premium Great Harvest bread combined with select fresh ingredients makes a delicious and wholesome sandwich. We make sandwiches on any of the freshly made bread for the day that we can run through our slicer. Any day of the week that means Honey Wheat, Harvest White, or Dakota (Pumpkin Seeds, Sesame Seeds, Sunflower seeds and Millet in 100% whole wheat bread) and Sourdough. Check the bread list (Bread and Goodies Menu) for bolded breads by the day of the week that they can be used to make sandwiches. We make Rye bread one day a week and any of our specialty breads that can be run through the slicer may also be available. All our deli meats are all natural with no artificial ingredients, preservatives or fillers. Come in and let us make one for you! 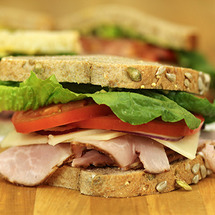 All Classic Sandwiches are made with thin sliced red onion, romaine lettuce, sliced tomato, white wine dijon mustard, mayonnaise, salt and pepper and your choice of sandwich bread. 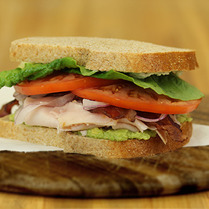 All Cold Signature Sandwiches are made with thin sliced red onion, romaine lettuce, sliced tomato, salt and pepper, and with your choice of sandwich bread. fresh avocado, all natural applewood-smoked turkey breast, and crispy bacon with a bleu cheese spread. Chunks of white meat chicken in a seasoned mayonnaise dressing with sweet & spicy pecans. Tender slices of all natural gourmet ham and Swiss cheese.